The pincer movement, or double envelopment, is a tactic in which forces attack both flanks (sides) of an enemy formation at the same time. 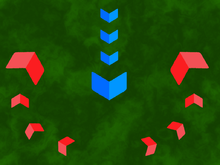 The pincer movement can be used when opposing forces advance towards the center of an army. That army responds by moving its outside forces to the enemy's flanks to surround it. At the same time, a second layer of pincers may attack on the more distant flanks to cut off the enemy reinforcements. A full pincer movement leads to the attacking army facing the enemy in front, on both flanks, and in the rear. If attacking pincers link up in the enemy's rear, the enemy is encircled. Such battles often end in surrender or destruction of the enemy force. The encircled force can try to break out or counterattack. A successful flanking maneuver can be difficult to accomplish. Sun Tzu, in The Art of War, talked about the maneuver. But he made the point to leave a surrounded enemy an escape route. Otherwise, faced with death, a surrounded enemy would fight much harder. This advice seems to have been followed by General George Patton when his sweeping pincer movement trapped the German army in the Falaise pocket in August 1944. The maneuver may have first been used at the Battle of Marathon in 490 BC. The historian Herodotus describes how the Athenian general Miltiades used it. During the battle, the weaker central formations retreated. this allowed the wings to come together behind the Persian battle line. It drove the Persians to retreat in panic. A famous example is at the Battle of Cannae in 216 BC by Hannibal. Military historians view this as one of the greater battlefield maneuvers in history. It was a favorite tactic used by Charlemagne against his enemies. He routinely divided his command into two armies in order to trap his enemy between them. Daniel Morgan used it effectively at the Battle of Cowpens in 1781 in South Carolina. The British troops thought Morgan's men were retreating and charged right into the trap. Flanking maneuvers were a major part of the German blitzkrieg during World War II. It involved fast movement by tanks, artillery and aircraft to overwhelm their enemies. This page was last changed on 28 June 2018, at 11:30.